Have you ever visited Northern Italy? 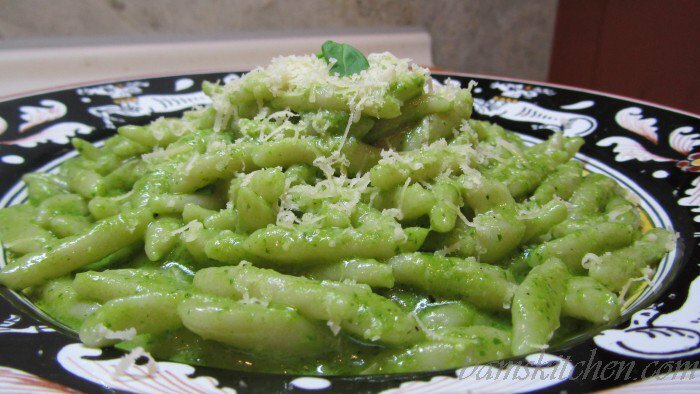 If you have been to the Ligurian region, you have may have tried their famous dish, Trofie al Pesto. 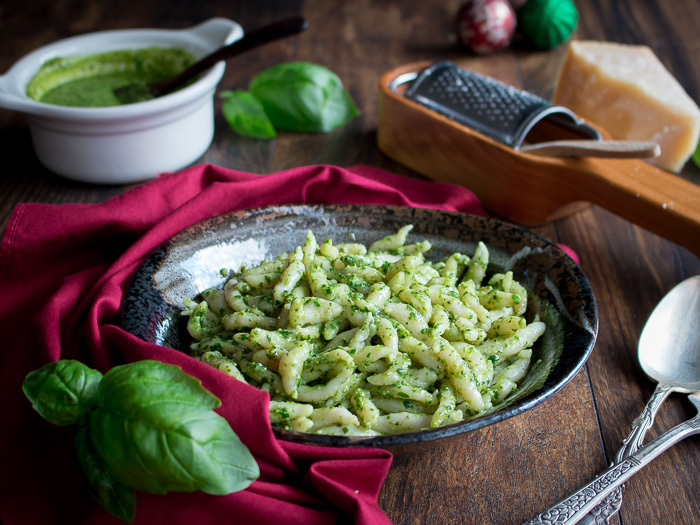 Lucky you, we are going to show you step by step how to make delicious homemade Trofie al pesto in your own kitchen. 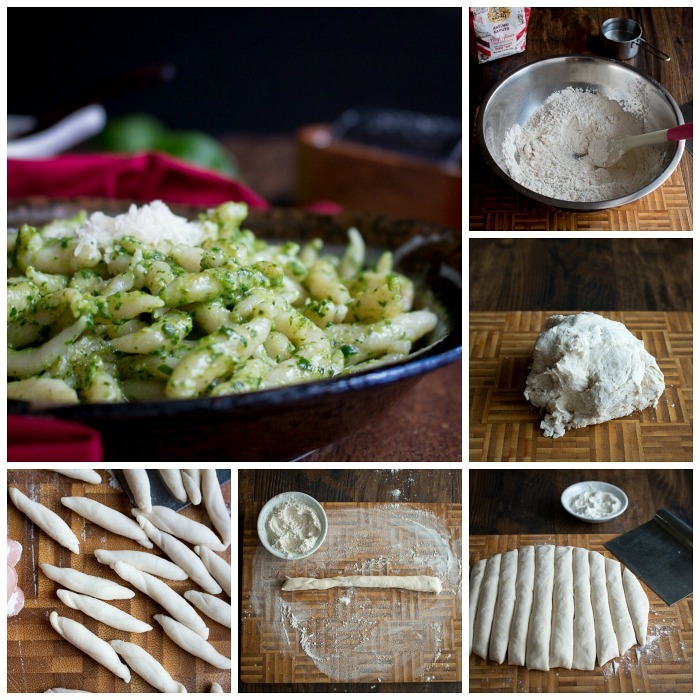 Have you ever tried making Trofie pasta? "Trofie" is an Italian word referring to the short, thin twisted pasta shapes from Northern Italy in the Ligurian region. 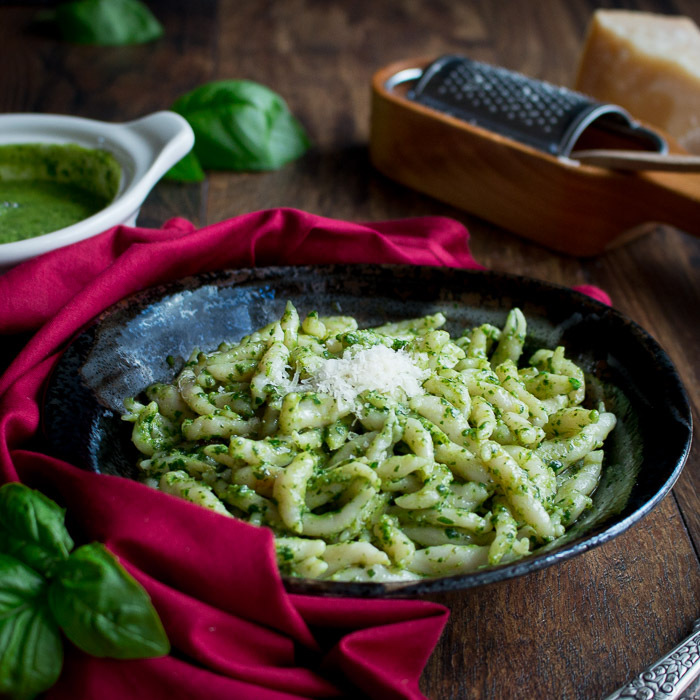 You are just going to love Trofie al Pesto with the aldente bites of the fun shaped noodles that are the perfect vessel for grabbing all of this delicious freshly made basil pesto. Trofie al pesto is a comfort dish made with just a handful of ingredients and would be a perfect side dish for your Feast of the Seven Fishes this holiday season. Will you be hosting family or friends over this holiday season or have your children home for the holidays? Trofie al pesto is a fun and interactive recipe that you can do with children as small as 2 years of age and over 98 years old. You are going to want to recruit their help in hand rolling the pasta. It is not hard to do. If you have ever played with play dough, you have a head start on the whole process. Maybe your kids will do better than you!!! However, it is a bit time consuming so all hands on deck. This is the type of pasta anyone can make at home without any special tools just a little Double 00 flour, water, salt and little love. 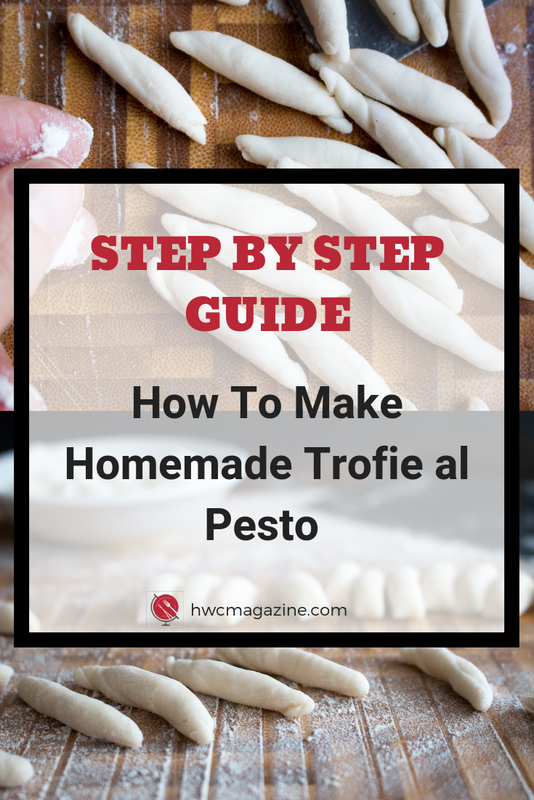 Scroll down to to the bottom of the page near the recipe to check out the step by step video to see the process on how to hand roll your trofie pasta. Do you Like Making Homemade Pasta? If you like making your own homemade fresh pasta be sure to try our 3 Cheese Spinach Ravioli and Sage Butter Sauce or Homemade Tagliatelle Pasta with Zucchini Blossoms Are you feeling ambitious this Holiday season? Be sure to try our Timpano Pasta Dome and you will steal the hearts of your friends and family forever! Every first Tuesday of every month, Jas from All That's Jas and Healthy World Cuisine unite to bring you a delicious NOODLE recipe from the WORLD. This week Healthy World Cuisine is going to Italy. Be sure to hop on over to All That's Jas to find her super easy and delicious recipe for her Noodles with Cabbage and Bacon Polish Haluski Recipe. We love seeing what noodle dishes you are making in your kitchen. Be sure to tag your noodle dishes you post with #noodleswithoutborders as we love seeing what you are making in your kitchen. You do not have to be a professional photographer to participate in the fun all flip phone photos and casual shots are welcome. Did you make any noodles dishes this week? The world is a very small place and is getting smaller each and every day. We do not mean in the physical sense that the earth is shrinking. However, it is through our acquaintances and experiences that brings us and the poles of the earth closer together. After living abroad, traveling abroad and sharing in a unique international world of very special foodies and travel bloggers, the world is a very small and cozy place. What is Your Bucket List for Travel? Food is the essence that brings every nationality together. Once you try something new, you have a new connection with that place on the globe. Learning the language and culture is also a big part of that picture. However, food tops our list of something that everyone can share, enjoy and remember. Can you share with us where you are from in the comments below and have your ever lived or visited Italy? 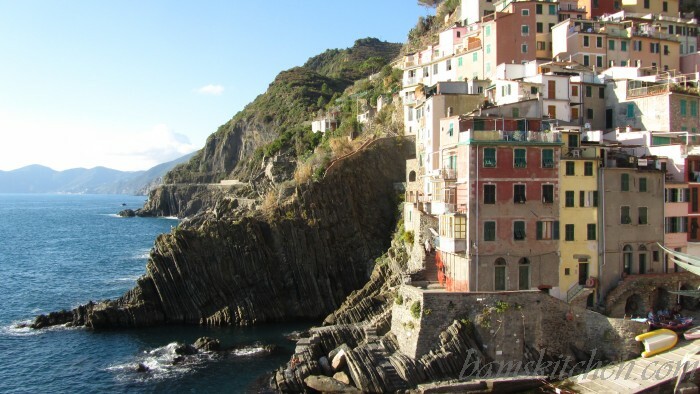 Our travels to Italy took us to the beautiful destination of Cinque Terre which is located on a rugged portion of coast on the Italian Riviera. It is in the Liguria region of Italy just to the west of the city of La Spezia. "The Five Lands" is composed of five villages: Monterosso al Mare,Vernazza, Corniglia, Manarola, and Riomaggiore. 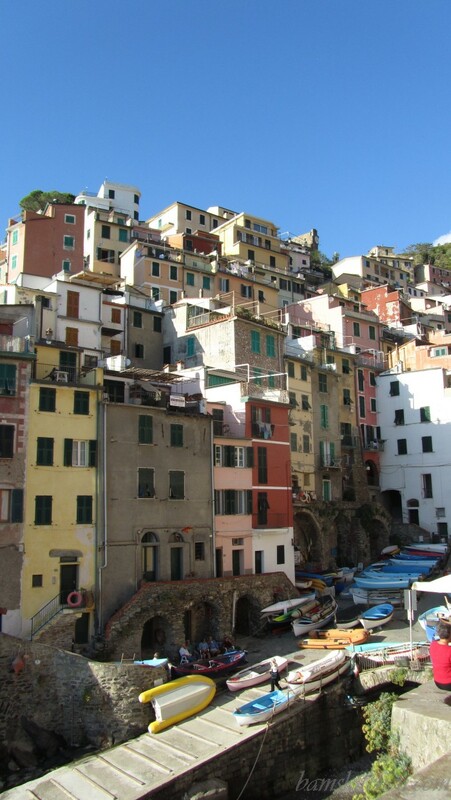 The coastline, the five villages, and the surrounding hillsides are all part of the Cinque Terre National Park. Cinque Terre is stunning and is a must do if you happen to visit this region. Do you want to learn more about the Cinque de Terra Region? At this delicious destination of Cinque de Terra we experienced our first delightful bite of delicious Trofie al Pesto. We contacted Letzia from Tasty Italy back in 2012 to learn more about the beautiful Cinque de Terra area and things we should try. If you want to learn more about the area, be sure to check out our guest post. We first wrote this Trofie al pesto post in October of 2012. We have made this recipe several times since then. We wanted to share with you the things we learned along the way and a new how to video (scroll down to the bottom of the page just above the recipe for the video). However, for sentimental reasons we have kept a couple of old point and shoot photos. Does this photo make you laugh or cry? As we have mentioned above all #noodleswithoutborders hashtags are welcome. 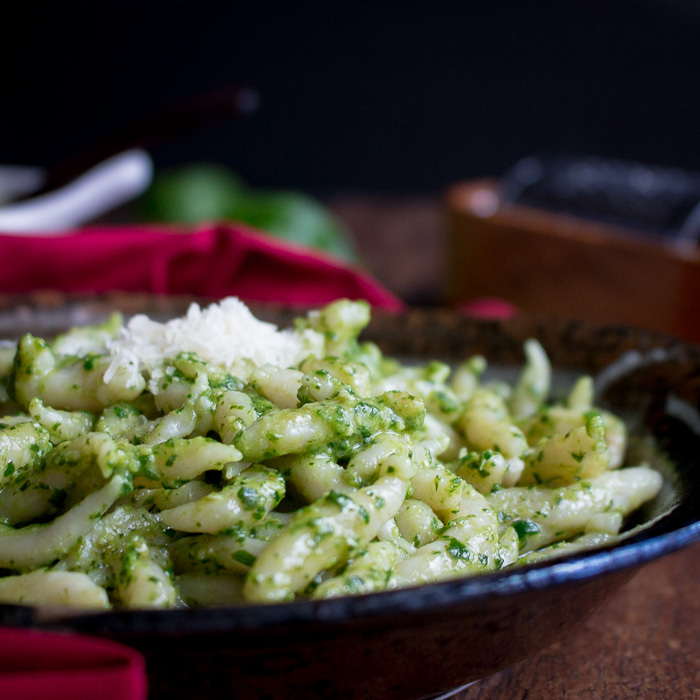 What Makes Trofie al Pesto Extra Special? Do you know? Any ideas of what is different about the Ligurian way of making basil pesto for Trofie al pesto? It is the addition of grass fed butter! Yes, believe it or not butter that makes it extra special, rich, cozy and makes you want to keep on going back for more. When we ate at the restaurant in the Liguria region, we asked our waitress what ingredients were in the pesto. She was delighted to be able to share with us the way her family had always made the recipe is with Butter. 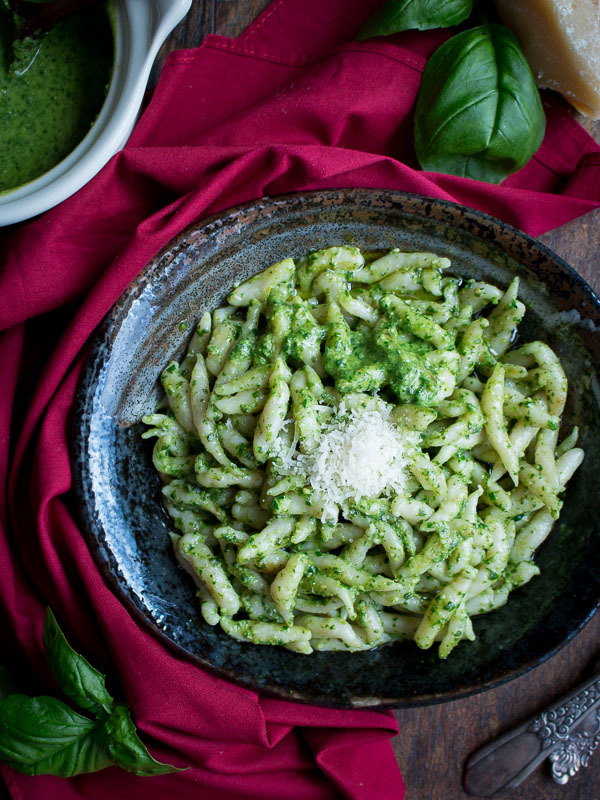 We are certain that every Italian family has their own twist on their version of the pesto for this recipe. Do you have a special addition to this recipe? If you are looking for another show stopper Italian pasta recipe for the holiday season, be sure to try our Timapano Pasta Dome. The Timpano Pasta Dome is a huge crowd pleaser and instagram worthy recipe. Can We Make Trofie al Pesto Vegan or Gluten Free? During kitchen testing of the Trofie al pesto recipe, we tried exchanging rice flour instead of a wheat based flour. It works but of course but the consistency changes a bit. In addition, the color is more white when cooked compared to traditional wheat based flour. You will need to adjust the cooking time to a little less or until just aldente. For fresh trofie made with a wheat based flour it takes about 3 minutes to cook depending on the size of your noodles. For trofie made with rice flour it was around 2 minutes to cook until aldente and of course this is also dependent on the size of your noodles. We have included recipe ingredients and instructions for the gluten-free Trofie pasta option in the recipe below. If you want to make your Trofie al pesto vegan just do not add the parmesan cheese or butter and instead add a little more pine nuts, salt and pepper or exchange with nutritional yeast to give it that flavor profile you desire. Make sure you salt your water to boil your noodles really well. As the noodles only cook for about 3 minutes or until aldente, it does not absorb much of the salt flavor. When you noodles float up to the top of the pot, it is a sign they are close to being cooked. 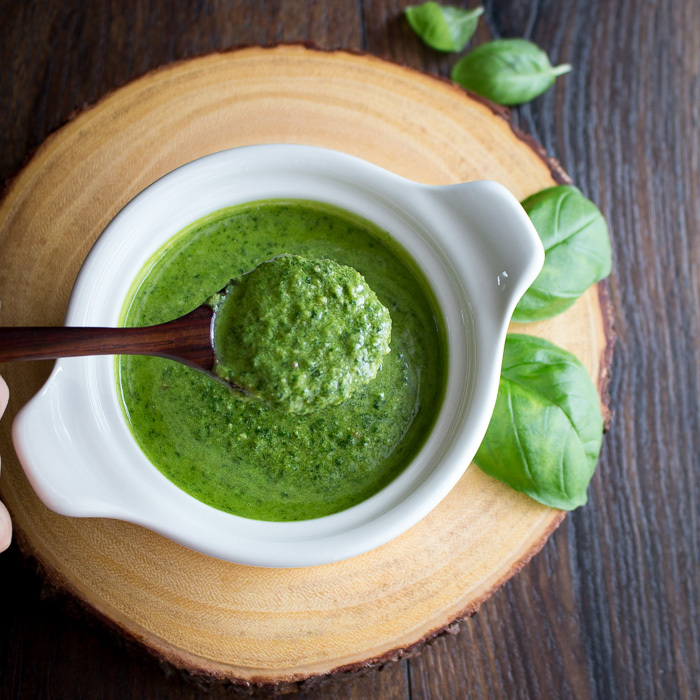 Try your trofie al pesto with a roasted red pepper pesto, spinach pesto or even a walnut pesto- super delicious. Sometimes this recipe is made with the addition of green beans and/ or sliced potatoes. Both are an a delicious addition. You can also make your trofie pasta in advance and let it dry. However, you will need to increase your cooking time. Fresh is always best. 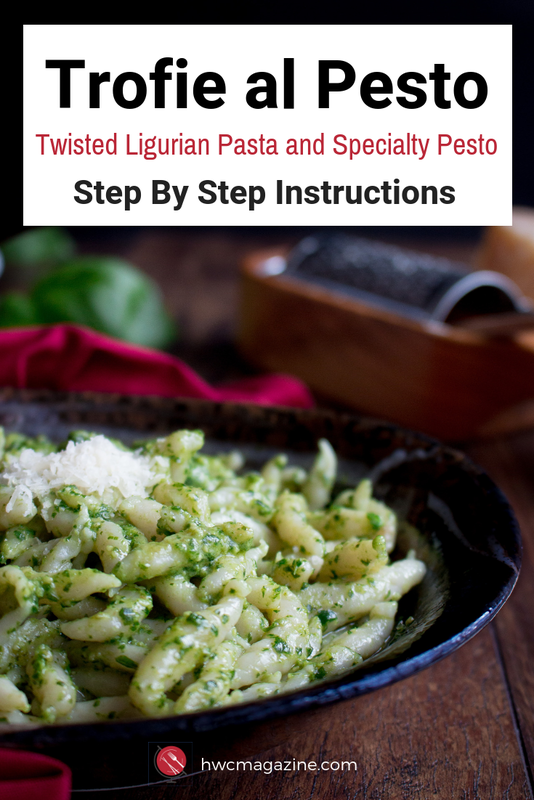 Make sure to use the BEST Extra Virgin Olive Oil you can get your hands on to make your pesto as this makes a huge difference in the authentic flavor of this recipe. We love Mie Radici olive oils. You can also buy Trofie pasta fresh and dried at the market, if you are short on time. Be sure to follow our HWC Magazine You Tube Channel for more quick and tasty recipes. 1In a large bowl mix flour with the salt. 2Make well and add the water in the well and mix slowly with a fork. 3When the dough mixture is pulled together start mixing the dough with your hands until well incorporated. Check the dough for consistency as it should feel slightly tacky but your finger should come back clean when you push it in the dough. Add more flour if too wet and if too dry start to knead dough and see if the natural moisture from your hands will convert the dough and if not can add a little drop of water. 4Place a little dusting of flour on your wooden board and knead the dough for at least 8-10 minutes or until the dough is very smooth. Nice and easy kneading and turn your dough with each press. 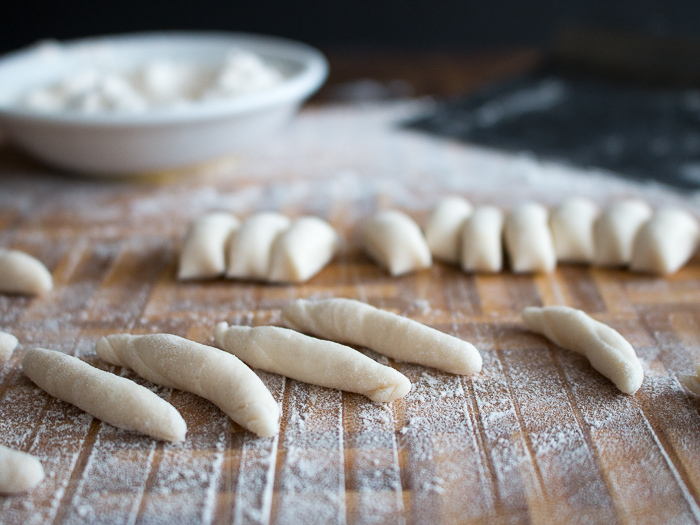 This is a very important step in the process to activate the glutens in the dough and give your pasta that very delicious texture. 5Form your dough into a disk shape and dust flour on top and bottom of dough and wrap tightly with plastic wrap and place in the refrigerator for at least one hour or even overnight. 7Now cut the rope horizontally into little sections about 1/4 inch in size or even smaller if you can. We made ours about the size of a pencil eraser or just slightly larger. 1Place fresh basil, pine nuts, garlic, parmesan cheese in blender or food processor and blend. Slowly add the oil in and continue to blend. 2Add the butter a little at a time to the food processor and keep blending until creamy and smooth. Taste and season with salt as required. 3Cooking the Trofie pasta: In a large pot bring at least 4 quarts of water to boil. Salt well as this gives flavor to the pasta. 4Once the water is at full boil, slowly add about 1/4 -1/2 of the homemade pasta at a time to the water. Depending how large you rolled your pasta it will take between 1-3 minutes to cook your pasta until a firm aldente. Your pasta will float up to the top and you will know that is nearly cooked. Just simply test a pasta to confirm if al dente. 6In a large frying pan, place a large knob of butter and add your cooked Trofie pasta. Next add about 1/2 to 3/4 of your delicious Ligurian Pesto, 1/2 ladle of your pasta water and delicately stir until well incorporated. 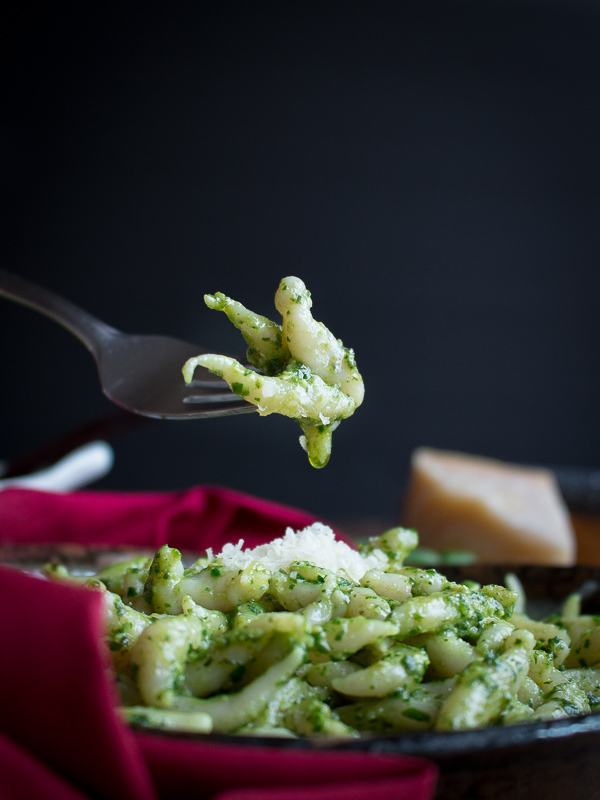 Place your delicious Trofie al Pesto in bowls and garnish with a grating of fresh Parmesan Reggiano and a sprig of fresh basil. 7Chef's notes: Make sure you a good amount of salt to your water to boil your pasta! If you want to make this recipe gluten-free substitute 00 flour or regular all purpose wheat flour with rice flour. Please note that this pasta will have a slightly different texture and will be whiter in color compared to a wheat base pasta. If you want to make this recipe vegan, exchange your parmesan cheese with a nutritional yeast and enjoy! 1Mix 1 cup Asian Rice Flour (super fine), 1/2 cup cornstarch or potato starch, 1/2 teaspoon salt together in a medium bowl. Add 1 cup boiling water a little at a time and mix until in is cool enough to touch. While the dough is still in the bowl start to knead to form a ball. Then, take your dough out of the bowl. 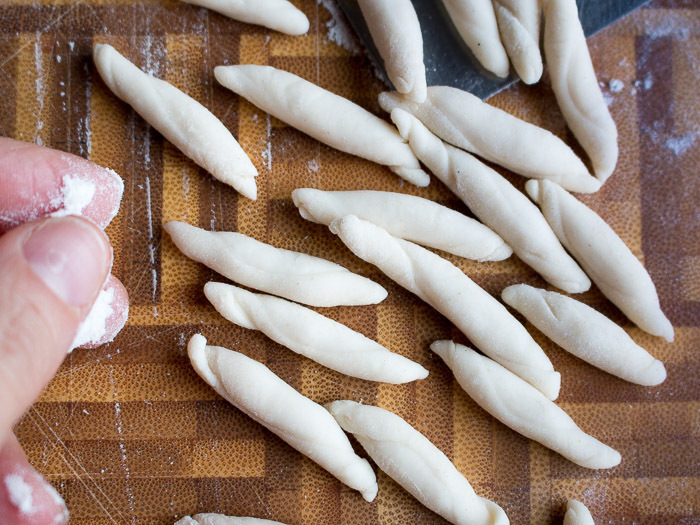 Use a little cornstarch on your hands and on the board and knead for 5- 8 minutes. Rest for at least 1/2 hour in plastic wrap. Form into trofie shaped pasta and boil with a little oil in the water. Boil for about 2 minutes until they start to rise to the top. The will be aldente but will still have a bit of chew in the texture. Drain and rinse with cool water. Complete the rest of the recipe as shown about for frying and adding the pesto. (FYI- needs to be super fine "Asian rice flour" and not the regular rice flour you find in the regular supermarkets and NOT glutinous rice flour. Each rice flour has their own consistency and you may need less or more water depending on the make of the flour brand. ) In Asia these noodles are sometimes called "silver noodles" and are also delicious tossed with a little garlic, ginger, chili, tamari sauce, sesame oil and chopped spring onion. Enjoy!